ROCKVILLE, Md. (DTN) — David Brown, of Carmine, Illinois, probably wouldn’t call himself a Southerner. But the corn, soybean and wheat farmer is getting a taste of Southern crop management this year, after southern corn rust breached the Mason-Dixon line for the second year in a row. Southern corn rust is known for its speed and the devastating yield losses it can deliver when left untreated, confirmed Southern Illinois University plant pathologist Jason Bond. A fairly common disease in Southern states, its appearance in southern Illinois in late July was a record-early arrival. Southern Illinois and Indiana farmers should plan for the possibility of the disease in 2017, Bond said. That means re-thinking fungicide timing, hybrid selection and planting date. Early planting — always an important goal — will be even more important than ever, Bond said. 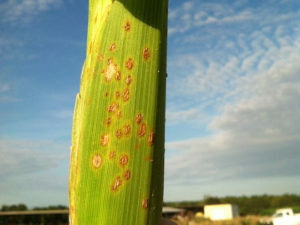 As July nears next year, Midwestern growers should also keep an eye on disease reports from their Southern neighbors, which serve as an early warning system for the rust’s arrival, Bond added. “We’ll need to watch the rainfall patterns, especially those with southerly flows,” Bond said. The fungus thrives in warm, soggy conditions, with plentiful humidity. Perhaps the biggest mental adjustment for Midwestern corn growers will be re-thinking fungicides, Bond said. Brown scouts for diseases like gray leaf spot and northern corn leaf blight and times any fungicide applications around tasseling (VT). Southern corn rust arrives later in the season, though, so fungicide applications before silking (R1) are unlikely to hold on long enough to control it, Bond said. Two fungicide applications is a tough prescription for corn growers to swallow these days, Bond conceded. He recommended that growers make a point of selecting hybrids with good resistance ratings for gray leaf spot and northern corn leaf blight, to keep those diseases in check. (Hybrids with resistance to southern corn rust are very rare). With the resistant varieties keeping these diseases at a lower level, a grower could likely get away with a lone fungicide treatment around R1 that could also serve to lessen any southern corn rust infestations that come their way, he noted. “The other thing to be cognizant of when picking hybrids this year [for 2017 planting] is stalk rot integrity,” he added. Diligent scouting late into the season will be critical in the future, Bond added. Rust diseases move fast and can overtake a field in just a week. You can see a Purdue guide that shows the differences between southern corn rust and common rust here: http://bit.ly/…. Last year, southern rust surfaced in southern Illinois in August and still managed to ding yields, Bond said. Last year, he saw a range of losses, from 10 to 50 bushels per acre. This year is likely to be uglier, he added. Wet weather delayed far more corn acres, and later-planted acres are much more susceptible to yield loss from the disease. The tight economic environment meant far fewer corn growers treated their acres with fungicide, Bond said. Not only does the disease steal resources from the plant, but it also causes premature death and stalk quality issues, Bond noted. Brown estimated that 50% of his corn acres, namely those planted in May, will see significant yield losses and a quarter of them are having serious standability problems. Every year, volunteers comb through cornfields in his county, counting ears and calculating an average county yield, Brown said. This year, they emerged from the cornfields of White County with an average of 155 bushels per acre in hand — and coated in orange dust. In Southern states, southern corn rust has been documented causing losses of 80 to 90 bushels in severe infestations. For more information on how Southern corn growers handle the disease, see this guide from North Carolina State University: http://bit.ly/….